We're super excited to announce that The World Series of Satin Casino Jackets will return to the Vegas Internet Mafia Family Picnic #VIMFP once again this year. Inspired by an old VT feature article honoring the lowly embroidered casino jacket, the one given out to slot tournament runner ups or sold in the casino gift shop, the World Series of Satin Casino Jackets is a bizarro fashion show and casino history lesson wrapped in competitive absurdity. WSOSCJ is also one of the many VIMFP events that you kinda, sorta have to see in person to believe. And even then you won't believe it. Yes. The World Series of Satin Casino Jackets is back. What can you do to prepare? First, Go comb thrift stores, flea markets, Etsy, Craigslist, eBay and your grandmother's closet in search of the most dazzling satin casino jacket you can possibly find and buy it. Then bring it to the Vegas Internet Mafia Family Picnic at The D on the weekend of October 14, 15 and 16 and strut your stuff. As you descend the grand stair case and walk the catwalk through the casino crowds will cheer and judges will judge awarding points for creativity, colors, condition and presentation, with points added for rarity including casinos that are closed or may have never even open! 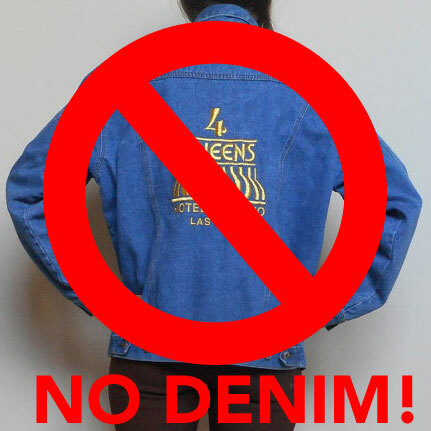 Jackets must have logos or names of a casino on them, and can be from any location - not just Las Vegas. There is only one rule in the World Series of Satin Casino Jackets - NO DENIM. The winners will win and the losers become heroes. Jaws will drop. Peep the official Vegas Internet Mafia Family Picnic schedule and follow @vimfp on Twitter.